CORPUS CHRISTI – When Hooks Baseball returns to Whataburger Field for four games this Labor Day Weekend, Coastal Bend residents have an opportunity to provide financial assistance and critical supplies to those affected by Hurricane Harvey in the Coastal Bend. Hooks VP/GM Michael Wood announced Wednesday that a portion of the weekend’s proceeds from all ballpark points-of-sale, including retail, concessions, the Whataburger store, Rudy’s Prize Wheel, and the Driscoll Health Plan Kids Zone will go for Hurricane Harvey relief. In addition, $5 from the sale of every ticket $6 or more goes to the relief effort. To promote affordability for citizens of affected areas, the Hooks are offering FREE PARKING and “Pay What You Can” seating in Corner Box Reserved sections of the ballpark, based on availability. There is also a grass Berm accommodation when Corner Box seat inventory is exhausted. All proceeds go directly to affected Coastal Bend areas. The Hooks and San Antonio Missions meet September 2, 3, and 4, at 7:05, 4:05, and 4:05, respectively. Gates open at 5:35, 3:05, and 3:05. Sunday features a doubleheader. Autographed Corpus Christi Game-Worn Jersey Auction: The Hooks will wear their road gray “Corpus Christi” jersey set during the San Antonio series. Submit your bids online Saturday, Sunday, and Monday. Go to cchooks.com beginning Saturday. Cash Donations: You can provide cash donations to the effort all homestand long by simply contributing at the 5-gallon water bottle at Section 119. Home Run Dollars: Hooks players have agreed to dedicate their season-long home run dollar take to the effort, so be sure to stuff your dollars into the bait bucket when it’s passed your way after a Corpus Christi home run. *Jim Crane, the Astros Ownership group and the Astros Foundation pledged to donate $4.0 million to the hurricane relief efforts. *Proceeds from the Share2Care 50/50 raffle for the remainder of the season will be donated to the American Red Cross, Houston relief efforts targeting hurricane victims. *Fans wishing to assist in the Hurricane Harvey relief efforts can now visit YouCaring.com/AstrosHarvey to donate. Proceeds will benefit the Astros Foundation’s hurricane relief efforts. *Additionally, Major League Baseball and the Major League Baseball Players Association announced that those parties will jointly donate $1.0 million to various relief efforts for the damage throughout the state of Texas created by Hurricane Harvey, including to the American Red Cross. *The Ballpark of the Palm Beaches, the Spring Training home of the Astros in West Palm Beach, Florida, is also assisting the hurricane relief efforts. They have teamed up with Crane Worldwide to get needed supplies to Houston. The staff at The Ballpark of the Palm Beaches is accepting donations for the hurricane victims. Crane Worldwide will provide the transportation of the collected items from Florida to Houston. Items can be dropped off at 5444 Haverhill Road, West Palm Beach, Florida 33407, through Wednesday, September 6. CORPUS CHRISTI – Hooks Camo Flag Caps to the first 1,500 fans from the Outlets at Corpus Christi Bay kick off the team’s annual Military Appreciation Night Thursday, June 22. Whataburger Field gates open at 5:35 p.m., with first pitch vs. the Frisco RoughRiders scheduled for 7:05. “We recognize current and former military members at games each night, but Thursday’s tribute enables us to go even deeper in demonstrating our appreciation for their sacrifices,” Hooks President Ken Schrom said. In addition to Thursday’s giveaway, military service members receive discounted tickets at the box office upon presentation of ID. An appearance by Skydive South Texas, a U.S. Navy re-enlistment, and Patriot Riders presence highlight the pregame ceremonies. The National Anthem will be performed by Marisol Castaneda. Also Thursday, Stripes presents Thirsty Thursday, with discounted soda and beer. The Hooks Can Help Your Group! Does your club, association or organization need to raise money? Once again, the Corpus Christi Hooks, Texas A&M-Corpus Christi and Kleberg Bank are offering a unique and simple fundraising program. 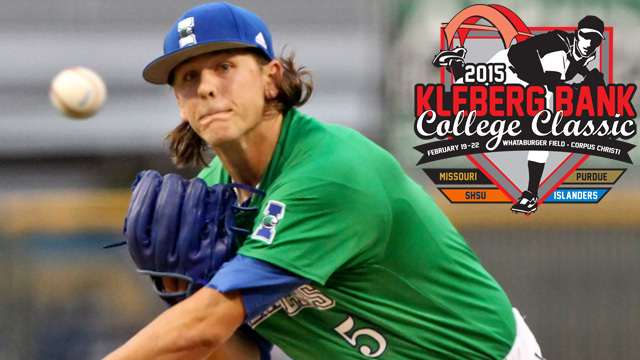 Groups can sell 2015 Kleberg Bank College Classic tickets and keep half the proceeds! Sam Houston State, Missouri and Purdue join the Islanders February 19-20-21-22 at Whataburger Field. The Bearkats and Islanders received votes in Collegiate Baseball’s preseason ranking of the Top 40 NCAA Division I teams. Missouri vs. Islanders, 6 p.m.
Sam Houston State vs. Missouri, 3 p.m.
Purdue vs. Islanders, 7 p.m.
Sam Houston State vs. Purdue, 11 a.m.
Purdue vs. Sam Houston State, 3 p.m.
Missouri vs. Islanders, 7 p.m.
Missouri vs. Purdue, 11 a.m.
Sam Houston State vs. Islanders, 3 p.m. This article originally appeared on the official website of the Corpus Christi Hooks. Click here to view the original story. The Hooks have earned the Texas League’s nomination for the John H. Moss Community Service Award, presented annually to a minor league team for its commitment to charitable service and support within the community and baseball industry. 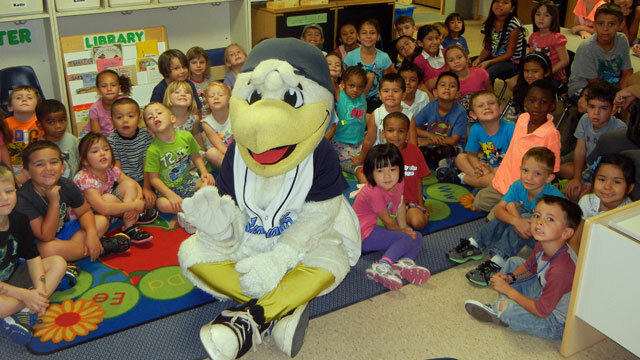 In 2014, the Hooks continued their long-standing community initiatives and took on new initiatives. Whataburger Youth Sports Day stood out as the newest addition. At every April and May Sunday game, youth baseball leagues from around South Texas received free game tickets and participated in a pre-game parade around the warning track. Over 4,100 tickets were distributed among eight organizations. Some of the longer running programs that continued in 2014 included the Get Hooked on Reading program, the Stripes Diamond and the South Texas Winter Baseball Banquet. The team’s oldest initiative is the Get Hooked on Reading program, started in 2004 and sponsored by Flint Hills Resources, which encourages children in grades one through eight to read during the summer months. The Stripes Diamond gives youth teams a chance to play at Whataburger Field. Located beyond the center field fence, the diamond has hosted over 540 squads, including 36 in 2014. The largest off-field baseball event in the Coastal Bend, the South Texas Winter Baseball Banquet serves as the unofficial “first pitch” to high school baseball each winter. The event features recognition for high school baseball and softball players, college baseball players, pros and a lifetime achievement award recipient. Growing year after year, the annual dinner attracted over 700 attendees in 2014. In addition to these community projects, the Hooks also participate in several fundraisers throughout the year, including AT&T Shirt off the Back Night and the Grande Grand Prize Game. Shirt off the Back Night takes place during the final homestand of each season and postgame player jerseys are raffled off to fans, who receive one ticket upon entry with the opportunity to purchase more. The money raised from additional raffle ticket purchases is then distributed to a non-profit organization. The Grand Prize Game, sponsored by Grande Communications, occurs once a month during the season. By purchasing a baseball for one dollar, fans have a chance to win or share $1,000 if they can chuck the ball into a wine barrel from the stands. Like Shirt off the Back Night, proceeds from this promotion also benefit a non-profit. Each minor league may nominate one of its teams for the award and the nominees are then reviewed by the MiLB Awards Committee, with recommendations being presented to MiLB senior management for a final decision. The community service award’s namesake, John H. Moss, founded the South Atlantic League in 1957 and served as its president for 50 years. The Grand Junction Rockies earned the inaugural honor last season. Reliant Energy, the Corpus Christi Independent School District and your Corpus Christi Hooks are joining forces to attack the child obesity crisis. MEND (Mind-Exercise-Nutrition-Do It!) is CCISD’s tool to work with overweight and obese children and their families. Teaching the target audience methods to develop behaviors that support sustainable and healthy lifestyles is the goal. 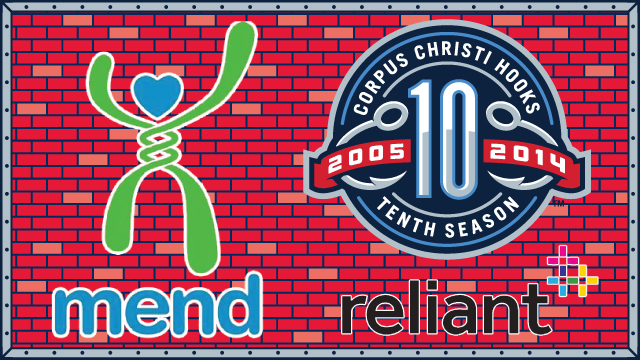 Reliant Energy has donated 5,000 general admission tickets to MEND program participants over three Hooks game dates – June 8, 9 and 11. On Sunday the 8th, up to 2,000 CCISD students and their families will hear pregame presentations from Corpus Christi manager Keith Bodie, members of his coaching staff and Hooks players about the importance of a healthy lifestyle. That evening, the Hooks play host to the San Antonio Missions at 6:10. This fall, MEND continues to tackle the issue with free 10-week weight management courses after school throughout CCISD. Fifteen campuses were involved during 2013-14. CORPUS CHRISTI – For 10 years, the Peace Tree Project of South Texas has been providing Community Embraces and planting live trees in honor of South Texas’ fallen service members. 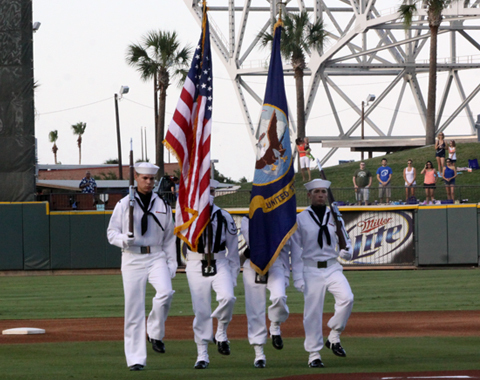 On Thursday, June 27, the organization will be honored by the Corpus Christi Hooks as Salute to the Military Night unfolds at Whataburger Field. On that evening in pregame ceremonies, the Peace Tree Project retires its shovels and fans raise a prayer and a wish for the safe return of all service members in 2014. “If your loved one answered the highest calling of service to our country by giving his or her life in Iraq or Afghanistan, we want to hear from you,” Peace Tree Project founder Norma Jean Sierra said. Sierra added that submitted names and photographs will be displayed on the Whataburger Field video board. Contact Sierra at peacetreeprojectstx@yahoo.com or call 361-906-5704. The Hooks are offering special reserved-seat ticket pricing on the 27th for active duty military and all who’ve honorably served, plus their immediate family members. Corpus Christi entertains the Springfield Cardinals that night at 7:05 and gates open at 5:30. 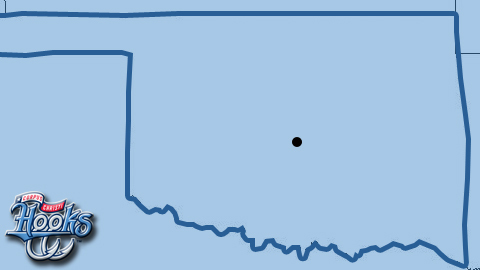 CORPUS CHRISTI – You can make a difference in assisting victims of the deadly Moore, Oklahoma tornado. When attending games at Whataburger Field starting Wednesday, please donate good-quality clothing for all ages, canned goods, toiletries, blankets, bedding, tents and bottled water at the 40-foot trailer provided by Ainsworth Trucking. The trailer will be parked in front of the ballpark’s main gates. Cash donations are needed to cover other needs. Hooks staff will man the trailer from 90 minutes before first pitch until the third inning. Donations made after the third and during business hours can be left at the Whataburger Field offices, right of main gates.